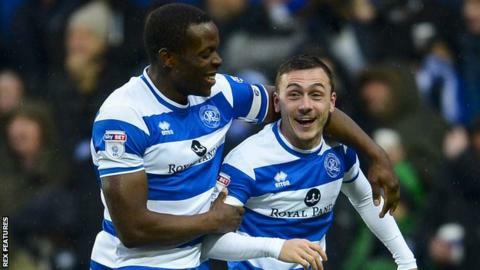 Former Barnsley midfielder Josh Scowen increased their relegation worries with a spectacular winner for 10-man QPR. Scowen collected the ball from a clearance and gave keeper Nick Townsend no chance with a curling 25-yard shot. Sub Ryan Manning was shown a straight red card for a late challenge on Barnsley debutant Matt Mills. But the visitors, who have not won at Loftus Road since 1950, could not find a way back into the game as they suffered a third successive defeat. Tykes boss Paul Heckingbottom, who signed an improved contract on Friday, sprang a surprise by giving Townsend his first game since October 2015 after more than 120 consecutive appearances by regular first-choice Adam Davies. He did not have to over-exert himself in a first half which saw Rangers failed to produce a shot on target, although Matt Smith was just wide with a header. Adam Hammill went close for the visitors with a half-volley just before the interval which Alex Smithies superbly pushed away, and the home keeper also blocked a shot on the turn by Tom Bradshaw following Scowen's first Rangers goal. Townsend prevented Conor Washington doubling QPR's lead late on in a one-on-one but Barnsley, who have won only once in 16 games, are just one place and one point above the relegation zone. "It was a huge performance and result, especially as we didn't play that well. We ground it out. You don't always flow. This is a learning thing for us. "How we didn't score a couple more I don't know, but I felt totally exhilarated with the pace of our breaks late on. "I'm gutted that Ryan was sent off, because he was doing well. "I want Ryan to tackle and he tried to make a tackle on a skiddy pitch. It wasn't intentional. It wasn't a nasty one." "We didn't score when we were on top first half - we had some good opportunities and worked the goalkeeper but we should've capitalised on that. "Probably the only spell where we were second-best, QPR built up momentum and even then we were comfortable. It took a worldie goal from Josh Scowen to win the game for them. "I have to credit QPR to be fair because with 10 men I thought they defended really well. We threw everything at them and put bodies forward, but they defended it well." Match ends, Queens Park Rangers 1, Barnsley 0. Second Half ends, Queens Park Rangers 1, Barnsley 0. Jack Robinson (Queens Park Rangers) is shown the yellow card. Attempt blocked. Pawel Wszolek (Queens Park Rangers) left footed shot from the centre of the box is blocked. Assisted by Bright Samuel. Attempt saved. Bright Samuel (Queens Park Rangers) right footed shot from the right side of the box is saved in the centre of the goal. Assisted by Pawel Wszolek with a through ball. Jack Robinson (Queens Park Rangers) wins a free kick in the defensive half. Substitution, Queens Park Rangers. Jake Bidwell replaces Conor Washington. Attempt blocked. Tom Bradshaw (Barnsley) header from the centre of the box is blocked. Assisted by Connor Mahoney with a cross. Delay in match Nick Townsend (Barnsley) because of an injury. Attempt saved. Conor Washington (Queens Park Rangers) right footed shot from the centre of the box is saved in the centre of the goal. Assisted by Jack Robinson. Attempt blocked. Bright Samuel (Queens Park Rangers) right footed shot from the centre of the box is blocked. Assisted by Pawel Wszolek. Corner, Barnsley. Conceded by Joel Lynch. Attempt blocked. George Moncur (Barnsley) right footed shot from the centre of the box is blocked. Assisted by Oliver McBurnie. Corner, Queens Park Rangers. Conceded by Andy Yiadom. Attempt blocked. Conor Washington (Queens Park Rangers) right footed shot from the right side of the box is blocked. Assisted by Josh Scowen with a headed pass. Attempt blocked. Bright Samuel (Queens Park Rangers) left footed shot from the left side of the box is blocked. Assisted by Conor Washington with a headed pass. Attempt missed. Oliver McBurnie (Barnsley) right footed shot from outside the box is too high. Assisted by Joe Williams. Conor Washington (Queens Park Rangers) wins a free kick in the attacking half. Substitution, Barnsley. Connor Mahoney replaces Daniel Pinillos. Offside, Barnsley. George Moncur tries a through ball, but Andy Yiadom is caught offside. Substitution, Queens Park Rangers. Bright Samuel replaces Matt Smith. Corner, Barnsley. Conceded by Nedum Onuoha. Attempt blocked. George Moncur (Barnsley) left footed shot from outside the box is blocked. Assisted by Andy Yiadom. Ryan Manning (Queens Park Rangers) is shown the red card. Matt Mills (Barnsley) wins a free kick on the right wing. Gary Gardner (Barnsley) wins a free kick in the attacking half. Substitution, Barnsley. Oliver McBurnie replaces Kieffer Moore. Substitution, Barnsley. Ryan Hedges replaces Adam Hammill. Substitution, Queens Park Rangers. Ryan Manning replaces Jordan Cousins.